Where do United's two super signings fit into the Van Gaal jigsaw? It is an often repeated mantra that Manchester United don’t buy super stars, they make them. Ronaldo, Vidic, Scholes, Giggs, Beckham, Solskjaer… the list goes on and on. But desperate times call for desperate measures and after a fragile start to the season and a second consecutive finish outside the top 4 a very real possibility, Ed Woodward ripped up the traditional United strategy and went big. In fact, the biggest British football has ever seen. But in some quarters, this sudden outburst of spending is seen to be counterintuitive. In fact, it was Louis van Gaal himself who bemoaned the amount of attacking players United’s squad boasted. It was imbalanced and a tricky jigsaw to piece together. Yet, once again the Old Trafford executives have brought in two attacking players and further selection headaches for the Dutch manager to contend with. Perhaps it is easier to see where Falcao will fit in. He is an out and out striker and will almost certainly start up front week in week out, though it is not as simple as slotting the Colombian straight in to the team. Two obstinate, almost undroppable, obstacles stand in the way. But one will have to make way. One will have to yield to the new signing. Egos will be bruised and battered. As Wayne Rooney has been newly appointed as captain, it would seem that the first man to cede his position would be the Dutchman Robin van Persie. However, whilst injury prone, he remains a razor sharp striker who would start up front for most teams in England. In years past, when United were fighting it out on four fronts, a policy of rotation would be the most logical and acceptable outcome. But this is a down year for the old leviathan. The once accepted norms now do not apply. And rotation for the sake of rotation, as Rafael Benitez found out during his years at Liverpool, can often throw players off their rhythm and undermine the team as a whole. Rooney dropping into the hole with Van Persie moving to join Falcao is one option. But this would only work if Mata were to be shunted wide or onto the bench. If Van Gaal’s embattled 3-5-2 project were to fail and he moved to 4-2-3-1 or a variant on the theme, that would cut down the options even further. It seems that Van Gaal at some stage will have to make a definitive decision on which strikers he will opt for in crunch time. Of course, it is difficult to decide on a starting striker when one of the options has yet to play a game for the reds, but it is hard to envisage a situation where Falcao does not start, especially with him only being on a temporary deal at this time. The most likely outcome will either see Rooney partner the Colombian up front or, if there is a change of formation, Rooney dropping deeper and Falcao leading the line alone. Whilst Van Gaal can only realistically play Falcao in one position, Angel Di Maria is much more versatile. In the past year at Real Madrid, Di Maria adapted to a left sided central midfield role to accommodate Ronaldo and Bale on the wings, and he excelled. Indeed, it was in midfield where the Argentine started against Burnley. But instead of playing as part of a midfield trio as he did in Madrid, he was part of a duo alongside Darren Fletcher. Where he had the freedom to contribute to attack in his Madrid role, against Burnley he was shackled. In the 3-5-2 formation the two midfielders are isolated and much is demanded of them defensively. They have to be a disciplined pair to secure the centre of the pitch, especially against tougher opponents. Whilst Di Maria possesses the composure and passing ability to play as part of a midfield two, if he is to be relied upon defensively his abilities will be wasted. The same argument can be used against him playing at left wing back. So this leaves one viable option remaining in the current 3-5-2 formation. The No 10 role. That is to say, Mata’s role. Mata himself did not come cheap and is a fantastic footballer. Whilst Di Maria could offer more pace and directness to the number 10 position, it surely would be a waste to leave out as talented and ingenious a player as Juan Mata. But this is the conundrum of the 3-5-2. Either Di Maria plays as an encumbered central midfielder, or he shunts the diminutive Spaniard out of the team. Which leaves one more option; a change of formation. 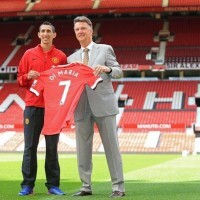 It is most likely that Van Gaal would opt for 4-3-3 or 4-2-3-1, giving him several positions to play his new number 7. The Argentine could return to a midfield three or an out and out flying winger in the 4-3-3, and he could play anywhere along the 3 in the 4-2-3-1. Van Gaal is known as a stubborn manager and will likely persist with 3-5-2 for as long as possible. But, were he to change, 4-2-3-1 would be the most obvious option, with Rooney, Mata and Di Maria playing as a fluid trio behind the leading striker. The selection problems that these two signings raise will be mulled over for hours by fans, journalists and coaches alike. But what all can agree on is that both bring a pace and directness that is sorely missing from United’s current attack. When comparing the top attacking sides of the world, there is one thing in common. They all possess a speed and vibrancy in attack that slices through the best defences. Against Burnley, Sunderland and Swansea we saw how far United’s attacking trio were from this standard. None of Van Persie, Rooney or Mata boast exceptional speed and there was a ponderous nature to the way attacks were constructed. When ruminating on the stagnant nature of United’s offensive play we see clearly that Di Maria and Falcao will fit straight in. Whatever the selection problems they bring, the two signings will immediately boost a beleaguered attack and bring it to the top of its game.